Learn how to code using the programing language Lua to create new objects and games in the Roblox world: from teleporting objects (or PCs/NPCs! ), to adding and applying power ups, to creating a leaderboard, and allowing players to save their games. This book walks you through the basics of the studio tool, provides tutorials for specific actions and creations, then explains how to use all of that knowledge to create your own unique game world! 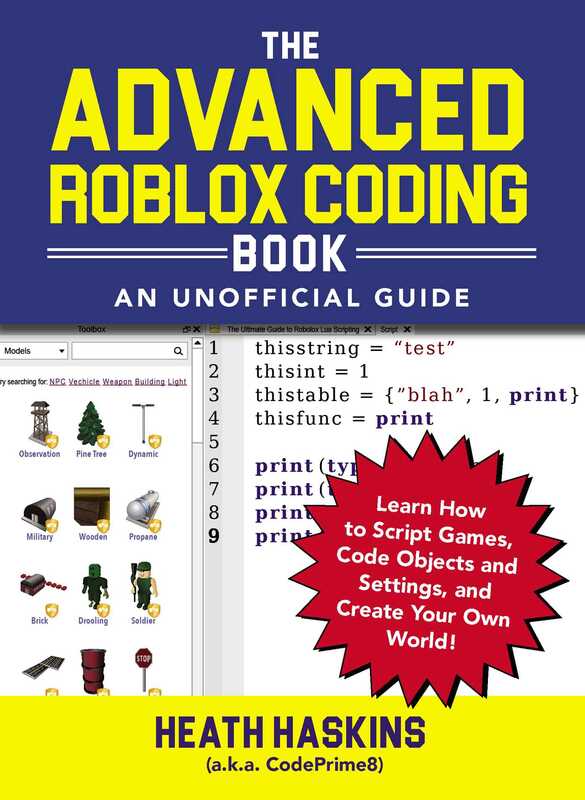 With detailed instructions, example screenshots, and simple explanations of what code to use and how to use it, this book is a must-have guide for any Roblox game designer—from beginners to expert coders! Heath Haskins is an IT ninja and master coder who has created tons of Roblox videos on his YouTube channel under the name CodePrime8. His videos have been viewed almost 14 million times! He stared programming at the age of 14, and has been learning to code ever since, and now holds degrees in programming and computer information systems. Heath works in IT, and lives in Springfield, Missouri with his wife Elizabeth and two kids, Hope and Oliver.